MOKPO -- A probe to shed light on the exact cause of the tragic sinking of the Sewol ferry will begin late next month, a special fact-finding body said Thursday. The eight-member panel set up last month by special law aims to allow maritime experts and lawyers to determine why the 6,800 ton ship capsized in waters off the southwest coast in 2014. The sinking resulted in the deaths of 304 people, with the remains of nine still unaccounted for. "We expect that the investigation will start as early as late May," said Kim Chang-joon, the chairman of the board. "It takes time to allocate the budget and recruit officials." At the weekly meeting on Friday, he said the members will discuss ways to check and review all former documents and reports related to the accident. After the sinking, the prosecution, state auditor and other judiciary bodies carried out their own inspections into the cause of the sinking. "We now have the Sewol on land. We will compare the existing records with the ship and verify them," said Kim. 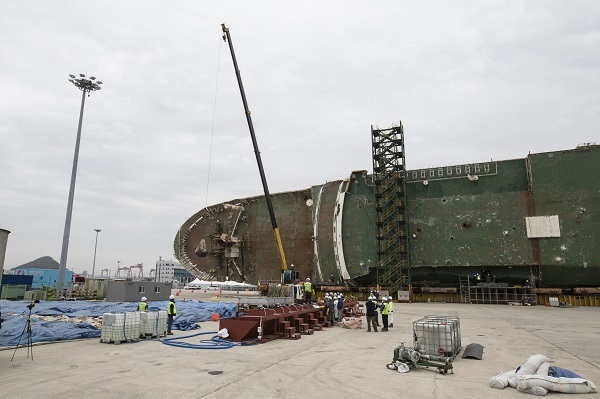 The wreck was raised from the bottom of the sea and put into dry dock at a local port in Mokpo, some 410 kilometers south of Seoul, last week. Search parties have been going into the wreck to look for remains. So far they have found two mobile phones and hundreds of personal belongings.